Click arrow below to watch video. CANNON BALL RIVER, North Dakota -- Water Protectors gathered for prayer, and climbed to the top of Turtle Island, yesterday, Tuesday, Dec. 27, 2016. There were at least four arrests reported, with projectiles fired at water protectors by police. Johnny Dangers reports as the struggle to protect the Missouri and Cannon Ball Rivers, and Treaty Land, continues. "Water Protectors peacefully gathered on the Barricaded Bridge. Humvees and many police vehicles waiting closely behind. Five, less than lethal rounds fired. Water Protectors have now left the bridge. 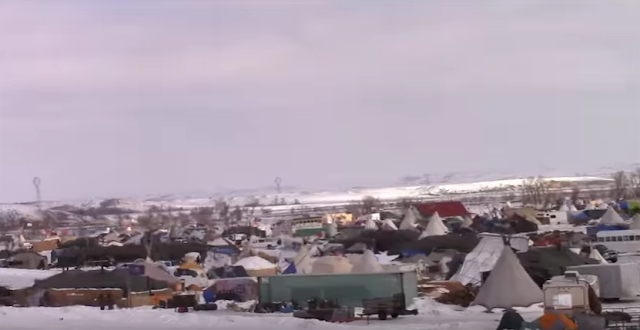 "Earlier today: Water Protectors are in a Prayer Circle at the top of Turtle Island and are at the Constantina wire with massive police mobilization close behind! Water Cannons drove out but turned around. Police armed with less than lethal weapons. 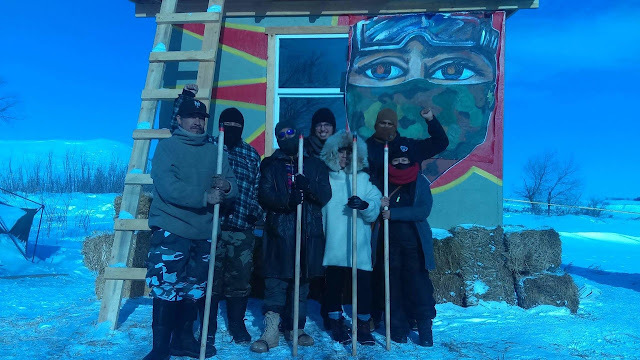 "2 pm today: Police Arrest and Violate the Religious Freedoms of 4 Peaceful Water Protectors Praying by the Mni Wiconi on a Peaceful Prayer Walk! Share Everywhere! Praying peacefully is a right all people have! Police mobilizing 5+ Humvees and massive presence! "Confirmed Arrested are Tawasi, Liotta, Likely Justin in a Santa Suit and one Peaceful Warrior. 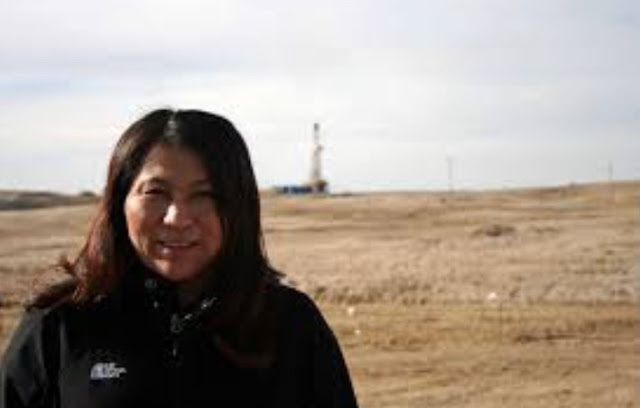 Call the Jail at 701-667-3318 and demand they release Peaceful Protectors who were praying. Let us know what they say! Share to spread the word and help to get them released!" 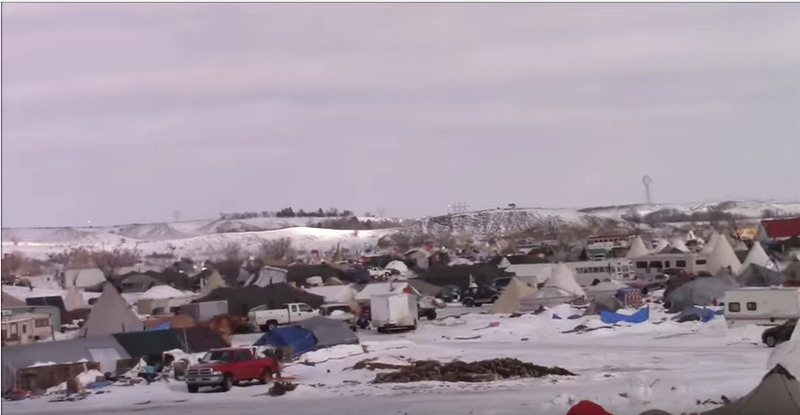 More than 1,000 people have survived in the big camp, Oceti Sakowin, through the blizzards, with more at Sacred Stones Camp and other camps near Standing Rock Indian Nation. Follow Johnny Dangers and Johnny K. Dangers for continued updates on the situation and more on defeating the Black Snake! 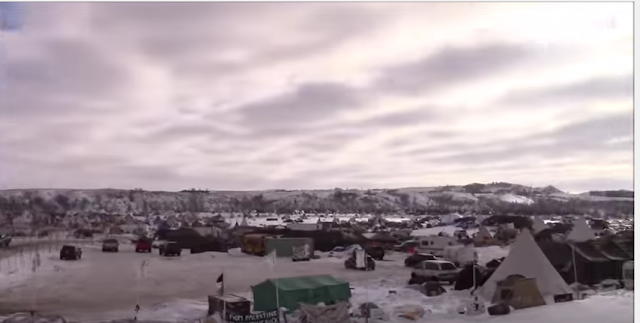 On Tuesday, Dakota Access Pipeline mercenaries threatened to shoot water protectors. 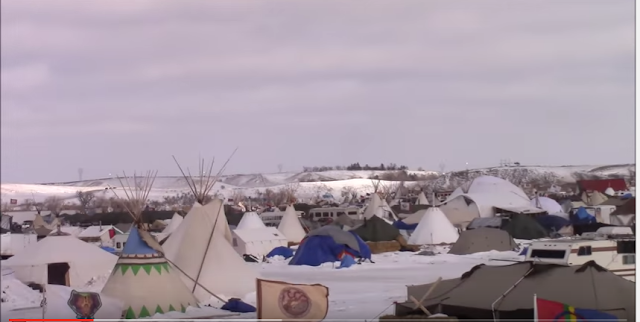 Others were arrested, including a Native youth dressed as Santa Claus, while police protecting the private pipeline fired rubber bullets at those in prayer, water protectors protecting the Missouri and Cannon Ball Rivers. I just called and they said some people were bonded out and some were going to court today. I asked why they were arrested and he said they were trespassing. I was expressing my outrage at the militarization of their police force and he interrupted to ask if I was watching the videos that the police department is putting out showing the violence that the water protectors were doing. I brought up the girl that that was hit with some type of projectile and was badly injured. He said she was building a bomb and it exploded and that's how she was hurt. He went on to say that the water protectors were throwing Molotov cocktails. I asked if he was seriously asking me to think that the police were in such danger that they had to use such force. He went on to say that the police dealing with this situation were much more peaceful than what one could expect from the police in a big city. I was about to ask how he could justify their use of water hoses in freezing weather and he wished me a happy new year and hung up. I just called. The first woman I spoke to would give me no information, said she just worked there, then hung up. The second call the man who answered was willing to tell me the details that one person had been bonded out, and the rest would go to court later in the afternoon. He said they were arrested for trespassing on private property. When I asked him if they were being treated well this time around with food, water and kindness he chuckled and said "of course. We are pretty nice around here." That's all he really had to say. Thank you for calling them! I suggest posting this ibfo as Google Reviews (1 star) on Wells Fargo, Bank of America, CitiBank and Morton County to get the word out far and wide and fast. Also close your accounts with these banks. I just called and was told they were posting bond as we speak (2:55pm MST on Dec 28). I asked why they were arrested if they were peaceful protestors and he said they were trespassing. I said that it is not private land it is their land under a treaty and if I wanted to say anything more about it I could call a different number and he hung up. (no number was given). I called but it's already after 11 there, the cat that answered said he got to work at 6:30 & no ones been arrested since he got there and he wasn't sure what was going on. Good idea 2 give the number tho, keep doing it por favor. Wrong. RCMP pulled this same bs tactic in Canada. Police are trained in a tactic called professional aggitators, where they hire people to infiltrate peaceful protestors, start violence so that they have the legal right to use aggressive force against us and manipulate the military, lower our profile, and cost us our support... which we NEED TO WIN. It is not in our BEST INTEREST to become violent. We understand that if we do that, we LOSE. No one is so stupid as to cross that line. We believe this same tactic was used at Wounded Knee. Don't fall for this bs. It is propaganda. We are not going to do what what we KNOW would cost us support and what we KNOW would cause us to lose when something means this much to us. No one is that stupid.